In the first quarter of every year, there seems to be at least one action packed thriller in theaters. Last year we were treated to the excellent Taken, an entertaining action film that became even more so once the unrated, and far better, DVD was released. 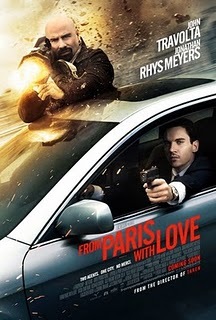 A year later, almost to the day, the filmmakers behind Taken are releasing another action picture, From Paris with Love, a movie with a similar style, but none of the polish. Jonathan Rhys Meyers plays James Reece, a man who works for the American Embassy in Paris and is working on getting promoted to a secret agent. His next assignment, the one that will finally give him that much desired promotion, is to haul Charlie Wax, played gratingly by John Travolta, around town as he does his dirty work busting bad guys and stopping a terrorist organization from unleashing their next fiendish scheme. How original. How unique. How, shall I say, avant garde of From Paris with Love to come up with such an unconventional plot. This movie is nothing more than other, better movies rolled into one. Travolta plays a character similar to his role in the recent Taking of Pelham 123, it uses the style of Taken, steals the title from James Bond's second film, From Russia with Love, and plays like a buddy cop movie, kind of like Lethal Weapon without the laughs, excitement, character depth or fun. There wasn't a frame of this thing where I saw even a hint of originality. You'd think with the director of Taken and the penman behind it concocting this story, there would be something to desire here, but there simply isn't. It's written so poorly, from the dialogue to the reoccurring motif, that a credible threat is never even established. From Paris with Love goes from scene to scene without so much as an explanation as to what is going on and why. All we know is that a terrorist organization is planning an attack, and we only learn that after dealing with an array of drug smugglers whose relevance to the plot is questionable. The problem lies in its broadness. Who is the leader of the terrorist organization? Is there any real reason they want to carry out this attack? The film never makes it clear who the characters are fighting against, so the whole routine becomes nothing more than shooting galleries where Charlie picks off dozens of indistinguishable men for unclear reasons. I wouldn't say that's necessarily a problem for all films. Some movies can have little to no story and still be a blast if the action scenes are carried out well (like Taken for instance), but the ones here are so bland that they may as well have been shooting water guns at each other. Nothing particularly exciting happens in any of them because most merely consist of Charlie popping in and out of cover while an endless parade of baddies rush through the door seemingly oblivious of their fallen comrades. I felt like I was watching a video game and had the controller taken away from me. If anything, From Paris with Love gives me a newfound appreciation for The Book of Eli and Edge of Darkness, two recent action flicks that, while certainly flawed, at least had some brains behind them. This one is more like a comatose victim that you look at and simply feel bad for.